New Compact model for 2019 ! The Companion Slide On has been designed using the latest modelling computer-aided design (CAD) and computer-aided engineering (CAE) in minutia detail. It is constructed to the highest engineering standards, built with high-quality marine grade aluminium, and utilises the latest rivet and adhesive construction. The Companion Slide On is suitable for most flat utility trays, comes with removable jack legs and will easily fit in a standard single garage. Click on the videos below to see how quick and easy it is to take off the road cover, set up and pack up the Easy Tent. Testimonial from Chris and Hilary Keeley. Apart from its rugged good looks, the Companion Slide On comes with a raft of innovative features to make your next camping experience as comfortable as possible. And, while everything about the Companion Slide On says ‘Yes’, there’s a lot you should ‘No’ about as well. Simply pull out the tent and lock into place. The Companion Slide On’s easy set up means you get more time to discover and explore. The innovative Easy Tent allows you to stay comfortable and dry with genuine, heavy-duty Australian made canvas. Access to a low queen sized bed is via a three-rung aluminium step that needs no lifting. There are ample storage spaces and shelves for packing away items, and it even comes with a self-cleaning floor! There’s not much we haven’t thought of when creating the Companion Slide On. It’s specially designed for luxury, comfort and convenience. However, there is a range of packages that allow you to customise your Companion Slide On to suit your camping preferences. Need more storage? Add a front storage box for dust free secure storage of bulky items like chemical toilets, prams, second extra fridge, generator, BBQ, tradesman tool box, the applications truly are endless. Fancy sleeping under the stars but don’t like roughing it? With the Ultimate Ventilation package, you can gaze through the moon roof across the Southern Cross and night sky. 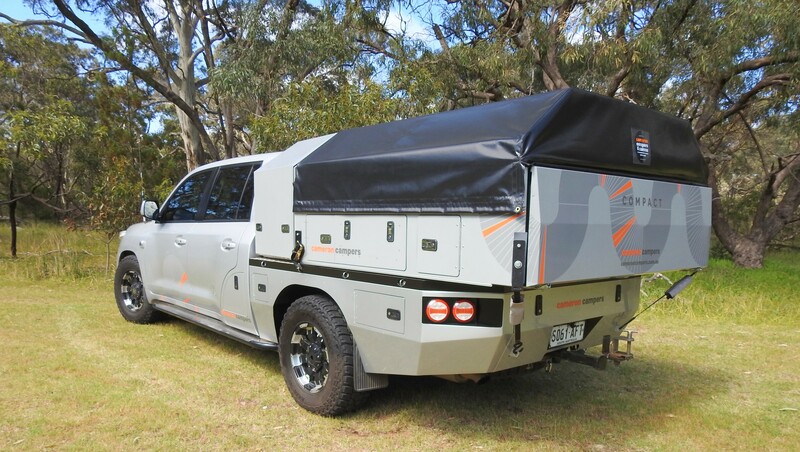 All Slide On Campers use the powder coating process because of its durability, longevity, great looks, and resistance to Australia’s harshest environmental conditions. You can trust your Cameron Slide On Camper for its build quality, reliability and safety.